Vision is an Italian publishing house that has been working in the archaeological publishing, devoting himself in particular to the reconstruction of the most important archaeological sites in Italy and the Mediterranean. 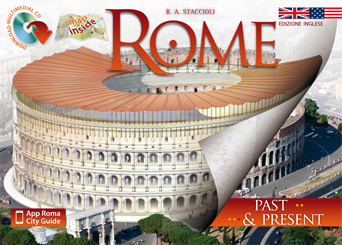 In this site, you can discover and buy our guides books for Rome, Pompeii, Ancient Sicily, Ancient Greece (Athens, Delphi, Crete and more), Middle East (Egypt, Jordan) and much more, with Past & Present images of their greatest monuments and archaeological sites. Our guidebooks are translated in over 15 languages. What will I find inside a Vision guide book? All Vision guidebooks contain a guide for the ancient city or archaeological site with several Past & Present images, curated by well-known archaeologists. Each reconstruction is made of transparent sheet so that it overlaps the photographic image of the monument to their current status, complementing missing appearances. Leafing through the guide, the reader may therefore overlap the reconstruction of the monument to the original photos, comparing how it was in the past and how it is today. The reconstructions are accompanied by explanatory texts, which tell the history of the period and describe the details and features of the monument. Can I buy the Vision guidebooks on this site? Yes, absolutely. Add to cart all the books that you like, then click on the shopping cart and complete the order. You’ll be asked to enter your information and your address, and you can pay with Paypal, credit card or bank transfer. As soon as payment is received, we will send books purchased in a carefully packed parcel by courier or standard mail. For any problem you can contact us at any time, using the contacts on the contact us page. You can pay for your purchases on this website through PayPal (which allows you to also pay by credit card, without necessarily having to open a Paypal account) and bank transfer. If you pay by bank transfer, please enter the number of your order in the bank transfer notes. How will you handle and ship my purchased guidebooks? We will ship your books, carefully packed, to the address you provided at the time of purchase. Shipping will be carried out using the shipping method you selected during purchase, in general within 2 working days after purchase. How soon will I get my guidebooks from the time of my purchase? The delivery time depends on the shipping method you choose during your purchase. With “Standard mail”, the delivery time usually is 7-14 days for Italy, 15-24 days for Europe, and 25-30 days for USA and the rest of the world. With “Express Courier”, the delivery time also depend on the geographic region where you are, but in most cases you will receive your books within 5 days from the time of your purchase. I purchased a guidebook but it has not arrived yet: what should I do? If you bought a guidebook, but it has not arrived within 10 days after the expected delivery date, please contact us at one of the addresses you find in the contact us page. The courier has passed but I was not at home, what should I do? Please e-mail us or phone us at one of the addresses that you find in the contact page, and we’ll do our best to help you solve your problem.